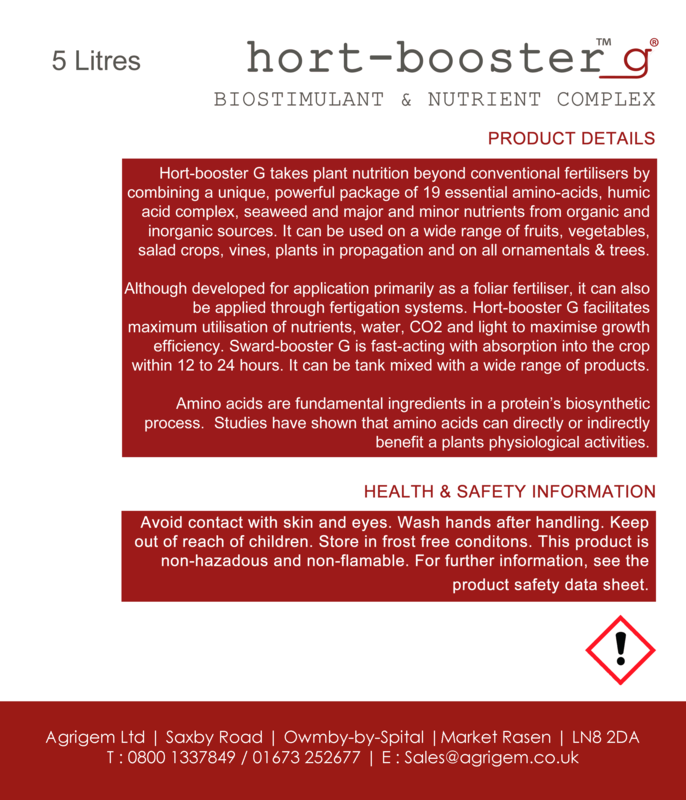 Hort-booster takes plant nutrition beyond conventional fertilisers by combining a unique, powerful package of 19 essential amino-acids, humic acid complex, seaweed and major and minor nutrients from organic and inorganic sources. Developed for application primarily as a foliar fertiliser, but can also be applied through fertigation systems for salad and soft fruit crops, Hort-booster facilitates maximum utilisation of nutrients, water, CO2 and light to maximise growth efficiency. Hort-booster is ideal for feeding or aiding stressed shrubs, flowers, trees, vegetables & fruit. It can be used on plants of all sizes & ages providing they are actively growing. Use of amino acids is a known method to increase crop yield and quality. Even though plants have the capacity to biosynthesize all of the amino acids that they require from nitrogen, carbon oxygen and hydrogen, the process is quite complex and energy consuming. The application of amino acids contained in Hort-booster allows the plant to save energy on this process during critical growth stages. Amino acids are fundamental ingredients in a protein’s biosynthetic process and nearly twenty amino acids types are involved in biosynthetic processes. Studies have shown that amino acids can directly or indirectly benefit a plants physiological activities. Amino acids can be applied through foliar feeding, or via fertigation to the roots and soil biota. Hort-booster additionally contains Humic and Fulvic acids and soluble seaweed extract, rich in a wide range of organic biostimulants and organic nutrients. Hort-booster is fast-acting with absorption into the crop within 12 to 24 hours. It can be used alone as a biostimulant or tank mixed with a wide range of products. Apply at 14 to 28 day intervals to maintain the effect. One application early in the crop cycle is often of most benefit. Apply 5 to 20 litres/ha depending on crop size. Dilute into 200 to 600 litres of water. For small areas via knapsack sprayer etc. dilute at 2 to 5ml/litre and apply to run-off. Apply 1 to 3 litres of Hort-booster per ha in the fertigation solution. If application is via a Dosatron or similar at 1% (1:100) dilution, apply 1 to 3 litres of HortiBoost per 100 litres of stock along with your normal fertigation feed every 1 to 2 weeks.